While more prestigious Downtown projects stumble and fall, there seems to be no stopping developer Geoffrey Palmer's takeover of Cesar Chavez. 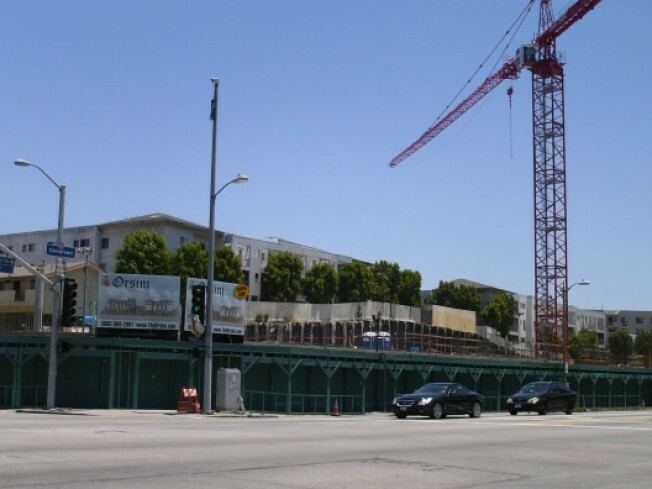 His latest faux-Tuscan apartment complex, the Orsini III, is filling up a hole at the northeastern corner of Cesar Chavez and Figueroa. These pics were taken at the lonely water fountain at the Orsini II across the street; no pedestrians were spotted for blocks and the bottom-floor retail spaces—which the city required Palmer to build—were all empty save for a construction office for Palmer. Based on the rendering, it looked like the 13,000 square feet of retail below O3 would suffer the same fate (the development leveled a popular BBQ joint). But the Downtown News reported last year that the city mandated, “Once [O3] reaches 75% occupancy, if tenancy in its commercial-retail space drops below 30%, Palmer must lower retail lease rates to match rates at similar Chinatown properties." According to Angelenic, "sustainable design features and more pedestrian-focused elements will be implemented into the mixed-use project — a far cry from the spiked window alcoves and above-street bridges common in Palmer’s other buildings." The new development will be five stories tall and feature 210 studio, one- and two-bedroom luxury rental units over a three-level podium containing the commercial space and a 477-space parking garage. According to a sales rep, rent prices remain TBD.